Simcha Even-Chen, a clay artist living in Rehovot, Israel, has been an active ceramicist since 1996, in addition to being a Senior Scientist at the Medical School, Hebrew University, Jerusalem. In 2013, after 22 years at the University she decided to devote herself entirely to ceramic. She had received significant awards and her ceramic artworks have been selected and exhibited at international exhibitions and have become part of museums, galleries and private collections. 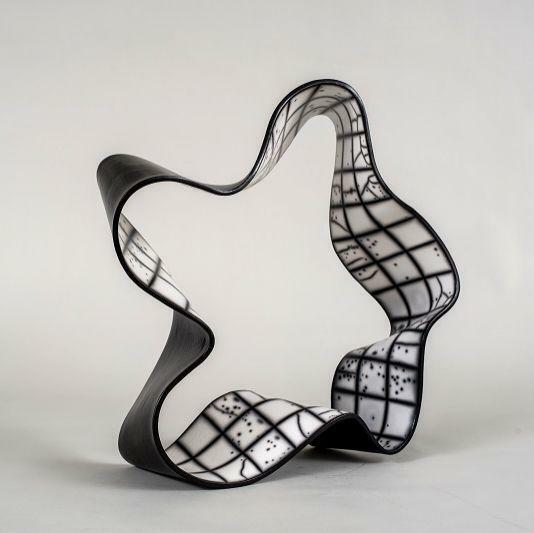 Simcha uses ceramics to investigate the relationship between “free” dimensional space and two-dimensional geometric surfaces, while examining the material’s point of collapse and dealing with non-defined shapes, giving way to new abstract, organic and free forms. The works are dealing with tension and balance at different levels such as: physical balance, tension between which is planned and which is not; between the expected and unexpected etc., all come from her scientific base of thinking. Borrowed from graphic paper, the grid-like pattern that covers her works offers a precise, scientific result. Although the works appear to be floating in midair, lacking any center of mass, the black color formed during the firing process using the Naked Raku technique bestows the illusion of gravitational grasp.